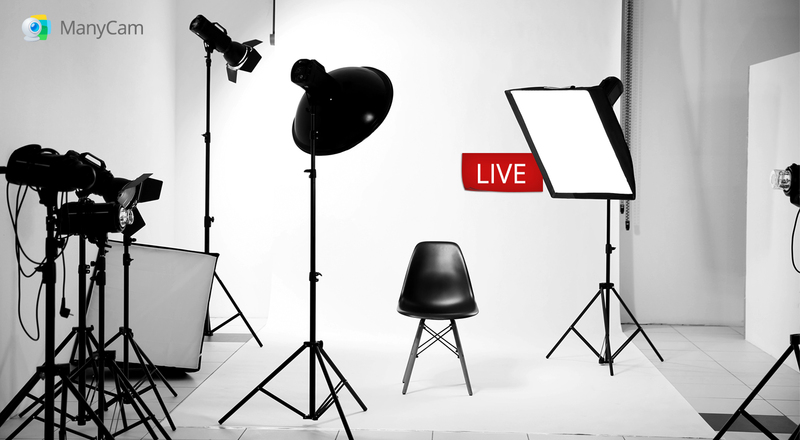 There are many possibilities when it comes to a live stream setup – different equipment, platforms and specifications – which can be overwhelming. Truth is, the right setup for you will come down to your budget. Here are a few tips on free platforms, low budget software and equipment, that can take your live streams to the next level. Facebook and YouTube are the two main live streaming platforms. Together, these platforms have more viewers than any other and their number of subscribers increases daily. Launched in 2016, Facebook Live now has 1.5 billion users beating YouTube and becoming the No. 1 platform for live streaming videos. It’s great a platform if you want to get more visibility and reach a bigger audience. If you already have a YouTube channel or you’re thinking about starting one, creating live videos is very effective to engage with your audience and get discovered during searches. Your live stream has a better chance of showing up on top of the list, mainly because it’s live and YouTube values fresh content. Want to know the secret to creating a perfect live stream on YouTube? Check out this post. You need to make sure you have a software to help you out during your live stream, where you can add different functionalities to your live streams and give them a professional video production feel. With ManyCam, you’ll be able to share your live stream on multiple platforms at once, so you don’t have to choose between your Facebook and your YouTube audience. 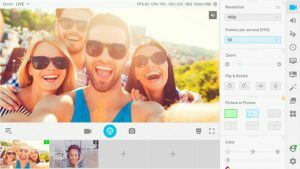 With this software, you’ll also be able to use multiple video sources, to create transitions and easily switch between showing your camera, desktop, mobile camera and more. Your live streams will be way more interesting to watch. And yes, you can turn your phone’s built-in camera into a webcam, placing it as an extra video source or even your main source. If you are broadcasting from your laptop, chances are you have a built-in webcam that you can use as part of your live stream setup. But if you want to get a better-quality image and you have the budget for it, consider getting an external HD (high definition) camera. HD devices will give you a clearer and crispier image. To take your live streams one step further, you should consider having more than one webcam. This setup would give you the ability to play around with camera transitions and points of view, creating a dynamic live video. 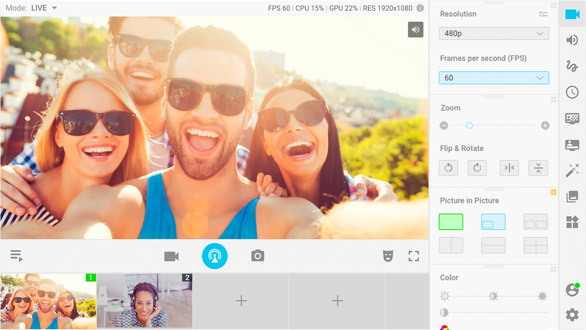 Instead of getting a second webcam, you can make the most out of your resources and use your phone as one of your live video sources. The ManyCam app allows you to add your phone’s built-in camera as a webcam, with a great quality and no extra cost for ManyCam subscribers. You can also stream directly through your phone, if you’re on the go. Find out more about the app here! The sound quality of your live stream is extremely important because, well, no one likes noise. An external microphone can come in really handy to help suppress unnecessary noise and give your live stream a better quality. But, if you are on a tight budget, you can use the internal microphone of your computer or even your mobile headphones. There’s nothing wrong with that, as long as you make sure you find a quiet place to do your live video. There are no specific requirements for a computer to do live streaming, but the software used during your broadcast might have some specifications. So, take your time to include that on your live stream setup. For example, here are ManyCam system requirements. Just keep in mind that your computer’s performance is directly related to the outcome of your live stream. If your computer doesn’t perform well, your live stream could suffer or even crash. One of the most crucial elements of a great live stream setup is the internet connection. If you don’t know the specifications of your internet connection, you can check-test them out on Speedtest . You’ll be able to see the speed of downloads and uploads. To stream HD videos, you’ll need a high upload speed. Minimum is 4 Mpbs but ideally above 10, to get amazing results. Although you may need to have higher upload speeds, you can stream SD videos (standard definition), which is around 720p with an upload speed of approximately 3 Mbps without too many issues. The most important thing before every live stream is testing. Before you go live, make sure everything is working properly and once you’re ready, go live and make the most of it!